Document sharing allows you to easily collaborate with multiple people on the same project. Onehub’s file-sharing solution is so easy to use that many companies jump in before fully exploring the available features and functionality. Onehub’s robust document sharing permission controls are something every user should know about because they give you laser-like precision when granting access. Setting permissions properly adds security and value to your file sharing strategies. In Onehub, our customers typically organize their information by project, department, or client. Our customers, who take advantage of our file sharing permissions, set rules for each folder and file when they share with others. They can give their invited users the ability to read-only, read/write, create, move, and/or delete. 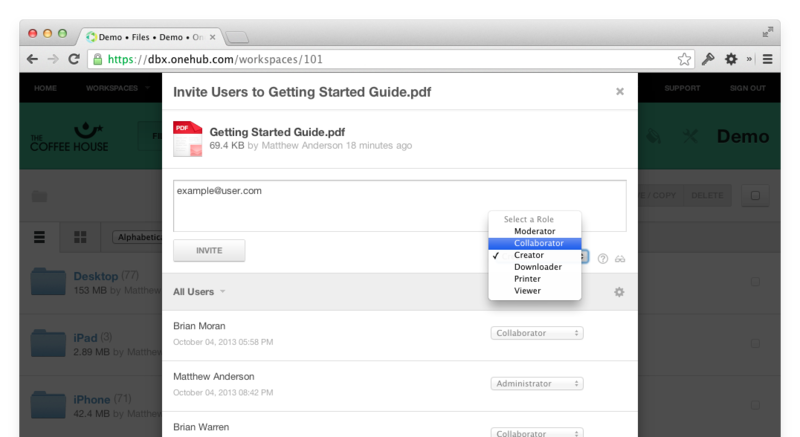 Onehub’s file sharing has preset role permissions that allow the owners of each Workspace (A Workspace is like a folder, only more powerful with messages, comments, dashboards and more) to easily select each level of access. These range from “Administrator” with full access to everything including creating, downloading, editing, and printing files to a “Viewer” role, which allows the user to only preview files. Additional roles include another top-level “Moderator” that has similar access as an Administrator but they cannot modify workspaces. “Collaborator” that can make edits to files, upload new files, and even delete files and folders from workspaces. “Creator” that can view files shared with them, but only edit and delete files that they own. Finally, “Downloader”, “Printer”, and “Viewer”, who are granted the least amount of options but can view every file that is shared with them. Selecting the right role for each person that a file is shared with is an important task and Onehub makes it easy to do. Learn more about Onehub’s role permissions. Here are some best practices when implementing online file sharing permissions: First, designate a small group to administer your company’s content structure. Once this group has been created, have one of them create your Workspaces and root folders. We recommend creating one Workspace for each department. Once the Workspaces have been set up, create the appropriate permissions. A good example would be to give the sales department “create/edit” access to the sales Workspace while other departments are set to “view only” or “no access”. Some departments such as human resources and accounting will probably have extremely limited access for the required people only when using document sharing. Once the Workspace structure has been set up, it will become the administrator’s job to monitor the Workspaces. Don’t be surprised if general maintenance is needed occasionally to reorganize things as your company grows and changes. Using document sharing permissions can protect your secure content from being shared with the wrong people, and from people changing, moving, or deleting important data. Taking the time to learn about sharing permissions, and setting them up, can ensure that your folders and files are easy to find and properly secured. Get started with secure document sharing on Onehub now.